Many of the above mentioned emission types also act as Green House Gasses (GHGs) i.e. gasses with a global warming potential. CO2 is the most important green house gas and one of the main reasons that life can exist on Earth in the form we know. As the name green house gas suggests CO2 acts like the glass in a greenhouse. Without it Earth would be a very cold and hostile place with an average surface temperature of about 20°C. When the energy (mostly visible light) from the sun hits the atmosphere about 50% is immediately reflected. The other half is absorbed by the earth’s atmosphere and surface which becomes heated. Heated bodies radiate energy in the infrared range, so infrared heating is emitted from the earth’s surface and atmosphere. 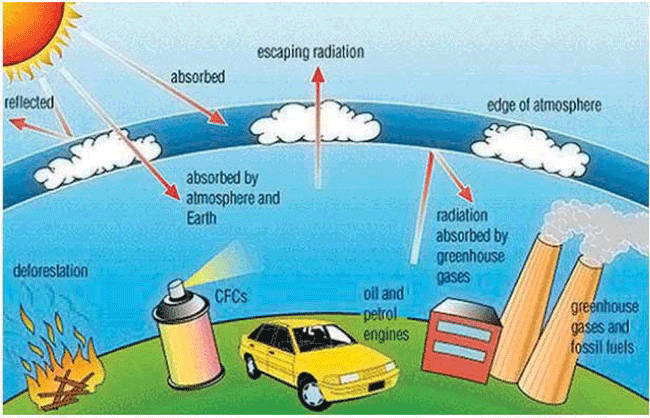 The GHGs trap the infrared radiation and radiate it on to other gasses in the atmosphere and back to the earth’s surface, and thus both atmosphere and earth is warmed as illustrated in figure 47. Figure 47 – Green house effect. Illustration from www.myclimatechange.net. Other green house gasses are refrigerants, fire protecting agents and propellants for spray cans. Classic refrigerants such as chlorofluorocarbon products (CFC products) with the trade name Freon have now been replaced by products without GHG effect. The Global Warming Potential (GWP) is given in relation to CO2in a given time span. In a 100 year time span the GWP for Freon is 4,000 8,500. The GWP of some GHGs are listed in Table 19. There are many natural sources of the GHG CH4such as wetlands and termites, but human activities such as oil refinery, farming and rubbish dumps are dominating. These sources are larger sources than actual combustion of fossil fuels. Table 19 – Global Warming Potential (GWP) for certain GHGs.